December 20, 2010, Felton, Calif. – Desert Dingo Racing announced today that Rugged Radios, a leading supplier of communication systems to the offroad, sandcar, UTV and racing industries, will sponsor the team for its 2011 season. The company will upgrade Desert Dingo’s Class 11 Stock Bug with its signature line Vertex VX2200 VHF mobile radio, a Rugged-designed RRP660 intercom (complete with iPhone adapter) and a HX370 Submersible VHF 40ch 5 Watt Handheld and headset that the team will use for spotting during short course races. A Web-optimized photo of the VX2200 is available here: http://tinyurl.com/2d4e2sc . The team finished second in class in the Valley Off Road Racing Association series and competed in the Baja 1000 in 2007, 2008 and 2009. For 2011 the team will campaign the entire VORRA series and return to Mexico for its fourth run at the Baja 1000. With over 15 year experience in the racing industry, Rugged Radios, a division of Rugged Race Products Inc., is dedicated to supplying the aviation, industrial, off road, racing, and safety communities with quality products. By exceeding our customer’s expectations in quality, service, and value, we are working hard to build long lasting relationships, not just one time sales. 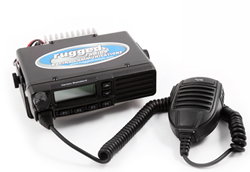 From headsets and radios to complete intercom systems, Rugged Radios has the right products for the Friday night racer to the professional race team. Call us and see why we are the perfect choice for your 2-way radio communications! For more information, visit them online at http://www.ruggedradios.com or call 888-541-7223.